Huntingdon Valley, PA - On January 12, 2006 PENNDOT presented a new plan which proposed to extend the tractor-trailer truck route into Somerton with the hope this plan would become a basis for the consensus alternative. The TCC did not approve the plan since it extended the truck route through residential neighborhoods. McCormick Taylor commented the TCC was close minded for not considering the plan. The TCC maintains that the extension was justified by the need to separate regional & local traffic, and since regional traffic does not exist, the extension is not warranted. The results of the O & D Study substantiate the TCC's position. While presenting the new plan, McCormick Taylor stated that no regional traffic would travel the new extension since it would have local traffic, while Byberry Road would have local-local traffic. "Do not draw additional traffic into the area." Hold your cursor over the map to learn more details. Route 1 is located in the lower right hand corner of the map. 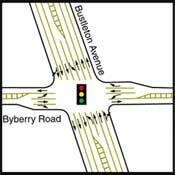 Byberry Road is located on the diagonal. 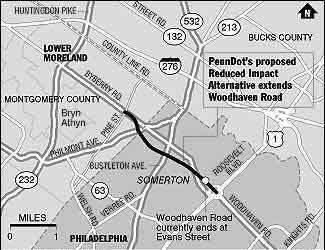 The dark line respresents the location of the newe extension which would extend the Woodhaven Expressway Truck Route to Byberry Road & Philmont Avenue. Increasing road capacity will generate more traffic & create the need for future highway expansion. 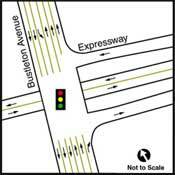 The Woodhaven Road Project is classified as 'Project B-021: Primary Purpose - Capacity.'. 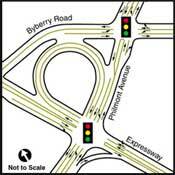 This document indicates the objective of the project is to increase road capacity. As documented in the traffic study, build alternatives that include the extension will result in significant increases in traffic volumes in the project area on a daily basis. 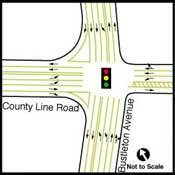 This will set the stage for future road expansion through additional neighborhoods.